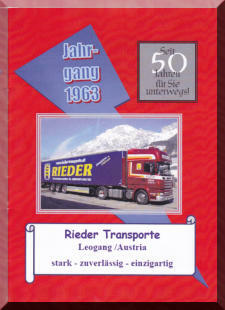 The transport company was founded in 1963 by Siegfried Rieder. Was in the beginning only the regional transport center of gravity, the activities were extended to the 1967/68 cross-border traffic. Back in the early 70's we tried for the bulk market, especially in ores and alloys. This specialization has continuously expanded in the volume and range of products. In 1980, the current operating area with garages, workshop and office was built in Leogang Hirnreit. In 1990, the company Palfinger, which dealt exclusively with marble, granite & tile transport was acquired. 1997 überahm son Christian Rieder management. 1999, a public workshop was taken with a brush car wash for trucks and buses in operation. 2004, the certification according to DIN EN ISO 9001: 2000. Rieder Transporte GmbH & Co KG is a family business. Due to the personal commitment of each individual we have a flexible and strong line team. Currently 20 people are employed. The current area of application is in the Austrian import, export and international transportation between the following countries: Italy - Germany - Benelux -Switzerland - Hungary - Czech Republic. Our core competencies are in the transportation of bulk materials, tile and stone products and jedliche type of product range. There are currently 3 tilt trailer trucks, 7 seat vehicles, 1 vehicle and 1 crane tipper Mulder in use. From a one-man operation was a powerful, international transport company. In 2013, the company was able to transport your Rieder 50-year anniversary celebrate with a feast worthy and numerous guests.